Compared to other areas of chemistry, predicting the impact of certain chemistries on the physical properties of a polymer is relatively easy. For instance, most undergraduate textbooks discuss how the length of a side arm alters the glass transition (Tg) of a polymer. Specifically looking at the various acrylate polymers, poly(methyl acrylate) has the highest Tg, while going to ethyl-, propyl-,... all the way to poly(octyl acrylate) you find ever decreasing Tg's. (A funny thing happens when you past octyl- to nonyl- and beyond; the side arms start crystallizing.) Another well understood phenomenon is adding ethylene oxide groups to the backbone to increase the flexibility of the polymer. While these are considered fairly fundamental concepts, not all functional groups have been studied. That's why this new research,"From Polyethylene to Polyester: Influence of Ester Groups on the Physical Properties" caught my eye. What exactly is the impact of an ester group on the physical properties of a polymer? While the article is behind a pay-per-view firewall, the abstract isn't, and this is one of those rare cases where the abstract tells you pretty much all you need to know. 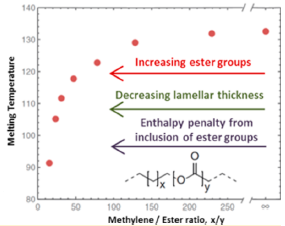 More ester groups decrease the melting temperature and the lamellar thickness of the crystals. What is somewhat surprising (maybe?) is how weak the effect is. Those numbers on the x-axis span a pretty large range, much larger than the simple methyl --> octyl example I gave earlier. But maybe that isn't so surprising. Had ester groups had a strong effect on polymers with an otherwise-saturated hydrocarbon backbone, someone would have noticed and documented it earlier.